In Bolivia, there is intense political turmoil centred around its energy policy. President Carlos Mesa offered his resignation on March 7, 2005, following weeks of widespread protests and a call by opposition leader Evo Morales for a nationwide road blockade. 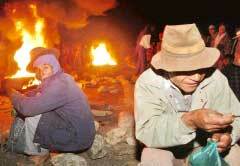 "Bolivia is on the path toward collective suicide. I can no longer govern like this," Mesa said in support of his resignation. The country's poverty-stricken indigenous communities want greater influence over economic policy, especially regarding oil and gas. The protests caused millions of dollars of daily losses to the business and food shortages in main cities. Mesa's resignation was, however, opposed by Bolivia's Congress. The president then called for early presidential and legislative elections and, on March 14, 2005, said he will not continue in office otherwise. But the Congress rejected this demand too. Finally, Mesa had to give in. "I have realised that I have the support of the Bolivian people, and will not turn my back on them. I will continue in this difficult task to try to reach a national agreement," he said. The Congress also partially approved an energy bill, a move that somewhat struck a balance between Mesa's and the indigenous communities' wishes. The bill incorporates Mesa's support for increasing foreign investment in the energy sector as well as the people's demand for higher taxes on foreign oil companies. It also fulfils the opposition's demand of giving indigenous communities the right to deny permission to oil companies to drill near their homes. But Mesa's energy minister was quoted as saying that there were "terrible problems" in the bill's approved version. The bill has to be passed by the country's Senate for it to become a law. Many blockades were lifted following the bill's approval. "We've decided to lift the blockades while the bill is heard in the Senate," said Roberto de la Cruz, a protest leader. After announcing his decision to continue in office, Mesa declared that a new law on taxing foreign energy firms will be passed soon. He said a referendum will be held on regional autonomy and a constituent assembly to define a new constitution. Before Mesa came to office in 2003, his predecessor Gonzalo Sanchez de Lozada had resigned following widespread street protests. At least 56 people were killed in the conflict at that time.